The fine folks at FRED, the economic data service of the St. Louis Fed, recently added seven new data series showing how various measures of federal debt compare to the economy as a whole, as measured by GDP. 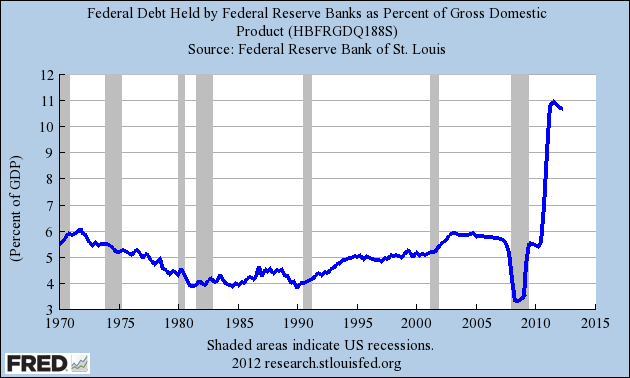 I particularly enjoyed this one, showing the federal debt owned by the Federal Reserve banks. Quantitative easing gets all the press these days and understandably so given the recent spike in Fed ownership of Treasuries, now equivalent to almost 11 percent of annual GDP. But the chart also reminds us of that brief period early in the financial crisis when the Fed sold lots of Treasuries so it could make loans and buy other assets. P.S. Anyone know how to get the FRED graph’s vertical axis to start at 0? A lovely infographic from xkcd tracing the party and ideology of members of Congress (click on graphic for full size). What a beautiful creature (click to enlarge). At this point, I usually would encourage you to read the accompanying article. In this case, though, caveat lector – parts are incredibly overwrought. But the other photos are lovely, including one of the mako with a great white. How Much Money Can You Raise by Capping Deductions? Governor Romney has proposed roughly $5 trillion in tax cuts, but he doesn’t want to reduce overall tax revenues. He hopes to generate some revenue by boosting the economy, but even if that works, he will need trillions of dollars of “base broadeners” — i.e., offsetting tax increases. Like most politicians, he’s been vague about what those base broadeners might be. But in the past few weeks, he has discussed the idea of capping the amount of itemized deductions taxpayers can take, perhaps to $17,000, $25,000, or $50,000. Eliminating all itemized deductions would yield about $2 trillion of additional revenue over ten years if we cut all rates by 20 percent and eliminate the AMT [DM: two key aspects of Romney’s tax proposal]. Capping deductions would generate less additional revenue, and the higher the cap, the smaller the gain. Limiting deductions to $17,000 would increase revenues by nearly $1.7 trillion over ten years. A $25,000 cap would yield roughly $1.3 trillion and a $50,000 cap would raise only about $760 billion. Capping itemized deductions at $25,000 would thus produce about one-quarter of the revenue needed to offset Governor Romney’s tax cuts, and completely eliminating them (which he has not suggested) would cover about 40% of the revenue needed. A much-deserved Nobel prize today for Lloyd Shapley and Alvin Roth for their theoretical and practical work on designing markets. In particular, matching markets where you don’t have prices to help you. This year’s Prize to Lloyd Shapley and Alvin Roth extends from abstract theory developed in the 1960s, over empirical work in the 1980s, to ongoing efforts to find practical solutions to real-world problems. Examples include the assignment of new doctors to hospitals, students to schools, and human organs for transplant to recipients. Lloyd Shapley made the early theoretical contributions, which were unexpectedly adopted two decades later when Alvin Roth investigated the market for U.S. doctors. His findings generated further analytical developments, as well as practical design of market institutions. 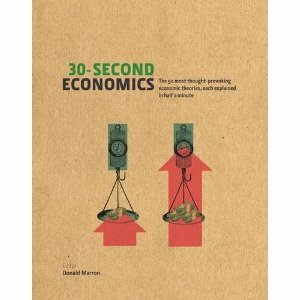 Traditional economic analysis studies markets where prices adjust so that supply equals demand. Both theory and practice show that markets function well in many cases. But in some situations, the standard market mechanism encounters problems, and there are cases where prices cannot be used at all to allocate resources. For example, many schools and universities are prevented from charging tuition fees and, in the case of human organs for transplants, monetary payments are ruled out on ethical grounds. Yet, in these – and many other – cases, an allocation has to be made. How do such processes actually work, and when is the outcome efficient? Along with his colleague David Gale, Shapley provided theoretical answers to these questions based on the idea of finding stable allocations (i.e., allocations in which no one would later have an incentive to change their mind). Roth then studied how those answers apply in real markets, e.g., designing algorithms to match doctors to hospitals. Roth also blogs at the aptly-named Market Design. What did he write about yesterday? How Nobel Prizes correlate with chocolate consumption. P.S. For a moving example of how well-designed matching markets improve human lives, see this post about kidney exchanges.